Recently I read a comment from someone on a blog post. The person said they’d never lost someone close to them. I thought, how is that even possible? They must be incredibly lucky. I remember from a very young age the loss of family members and friends. I was never lucky enough not to know hurt. To this day, I can’t hear Amazing Grace or How Great Thou Art without tearing up. Both were sung/played at great grandparents and grandparent’s funerals among others. Even when I was a tender 10 years old, I knew what death meant and what it did to people. My grandparents were killed in a car accident in February 1989 and it’s the little things I remember about that day and the days following that still have an impact on me. Grandpa Roy’s glasses folded on the console of the car. Grandmother’s personal effects. It was tough. I felt like I never got to know them. 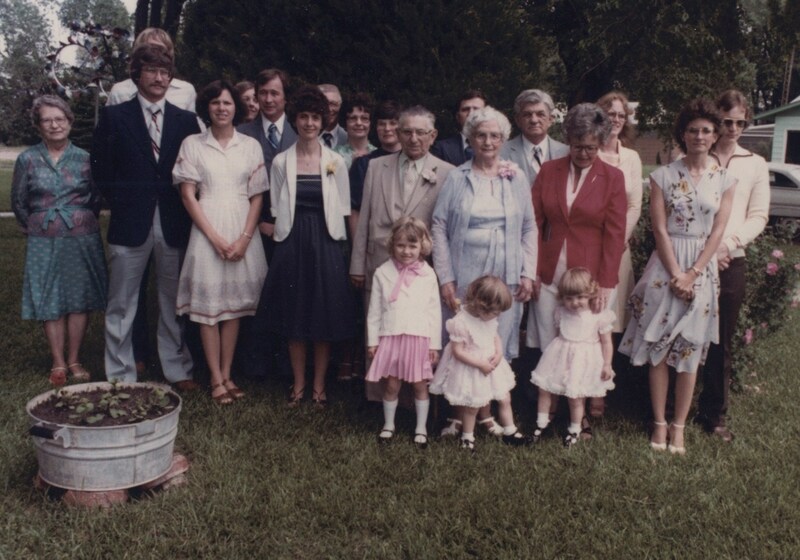 I have the app Timehop on my phone and on April 3 it showed a photo of my grandparents. I stopped in my tracks and thought about that day with Mom and her sisters. Grandma Wetzel has been gone for 4 years now and never got to meet both of my children. I was pregnant with my first when she passed away. I shared the photo, but didn’t feel like explaining myself. My father-in-law has been gone for a couple of years now and I’ve posted about him before, but this year, I couldn’t remember his death again. I didn’t want to. Then, last week my oldest son said out of the blue, “Dad misses his dad.” I said, “I know, I do too.” He continued, “I wish my grandpa that died was still here. I miss him.” Out of the mouth of an almost 4-year-old, and he spoke the truth. I about cried. It’s hard, and it’s even harder when the young ones don’t understand. Best we can do is remember them, and for me, photos are it. 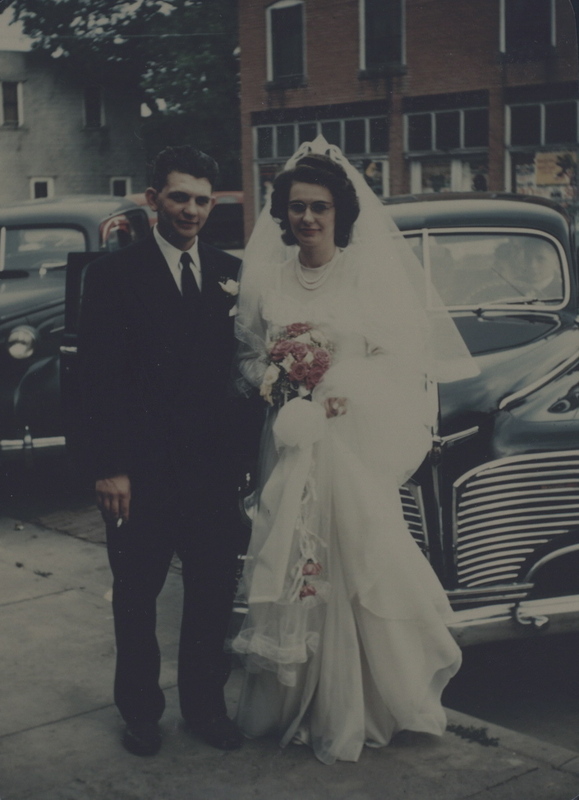 Carol and Erna Wetzel on their wedding day, June 2, 1948. On Nov. 1 I was sitting watching TV while the boys napped. Scrolling through Facebook most friends were sharing photos of their kids on Halloween. I had done the same. My ears perked when I heard jingle bells ringing on a commercial for some store. Seriously, I thought. Halloween was JUST yesterday. Later in the evening we were watching a football game, and the same commercial I had watched earlier in the day was on, and I made the comment rather sarcastically, “And so it starts..” What starts? My husband asked. The barrage of Christmas commercials. “Oh you’re annoyed by everything,” he said. I rolled my eyes and shook my head at him. But it’s true. Christmas commercials before Halloween annoy me. Christmas commercials after Halloween annoy me. Christmas commercials before thanksgiving annoy me. But yet, I’m planning my assault on buying Christmas gifts for the boys and family. I haven’t bought anything yet, but it’s always good to have a plan. As a kid I don’t remember being barraged by Christmas. I do remember the excited girls who marked pages in the JC Penney and Sears catalogs with the items they wanted. I do remember participating and going to practice for the annual Christmas Eve program at church (I was always an angel). I do remember bundling up for the ride to Grandma and Grandpa Wetzel’s for a day of packages, food and fun on Christmas day. There was no telling what could happen when all my mom’s siblings got together for a day. I remember one impromptu snowball fight that ended up in wet clothes and a lot of laughter. Now that I have kids of my own I try to make their Christmas experiences memorable. Last year we took Shaun around to look at the lights and he still asks if we could go drive through those neighborhoods in town to see the decorations. At the little country church we attend on Christmas Eve, members circle the church at the end of the service and hold candles while singing Silent Night. Last Sunday at church Shaun asked if we could blow out the candles again. I told him at Christmas time we will. It’s really not about the packages or the commercialization of the holiday. The point of Christmas is to remember the real reason it is celebrated, and to spend time with friends and family. 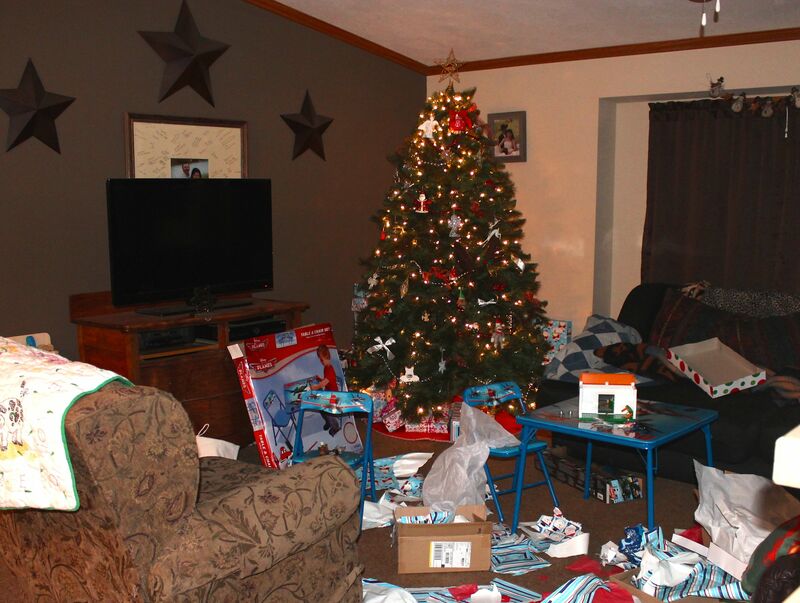 The aftermath of Christmas 2013 at our house. I’ve heard siblings’ personalities can be like night and day, and with my boys I believe it. My second son is one of the easiest going, happiest kids I have ever been around. I’m pretty partial, but every where we have taken him he’s been great. He only cries when he’s hungry or annoyed and shares a lot of smiles. Tuesday was no different. In the last month of my pregnancy with Chance I remember feeling as though he was stuck in a weird position and my right side always seemed to have some sort of ache or pain. I didn’t think much about it as Shaun was wedged in a similar position. There’s not much room to go in my 5-foot something frame. When Chance was born on his scheduled birthday, I was brought to tears because he was “so small” (as small as an 8 pounder could be) and I got to hear him cry. I didn’t get to see my first son or hear him cry due to complications with my cesarean so it was a little overwhelming. After we got settled into a routine at home, I noticed Chance liked to sleep a lot and normally kept his head turned right. By his two month appointment we questioned our doctor about the flat spot forming on the back of his head. He suggested several positioning techniques and more tummy time. We tried what he suggested, but the flatness stayed. By his four-month appointment the “funny shaped” head was pretty prominent. I again expressed my concerns to the doctor and he felt the same as me. After some investigation he sent us to an occupational therapist in Wichita and we had an appointment with a helmet company. As the days approached for the appointment I felt anxious. What would they do or say? Internally I was blaming myself for not giving him the room he needed in utero or not putting him to sleep in another position. I just wanted sleep and the way he went to sleep and stayed asleep was fine with me so I could get some rest. I am his mother, so it’s my job to do whats best for him and I’ve felt like I’ve failed. After the appointment with the occupational therapist they told us he has torticollis. Basically his neck muscles are tight on his left side and thus the flat spot on his head. Also, due to his cranial measurements they suggested he get fitted for a helmet. Although i knew it was a possibility, I was still disheartened. But after catching glimpses of the other kids in the occupational therapy clinic, my thoughts of worry and failure didn’t seem very important. We are blessed to have him and will work through what ever is thrown our way. 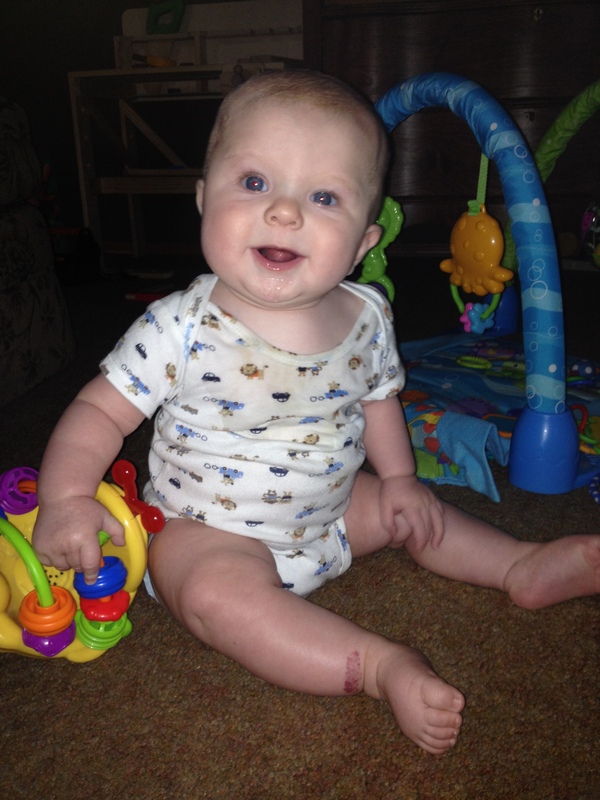 See Mom, I can sit up all by myself. My oldest son will be 3 tomorrow. Hard to believe it’s been 3 years already, but don’t all parents say that? Heck, our youngest turned 3 months old on the sixth. Now that is hard to believe! Where have the last 3 months gone? But, that’s not the point of my post today. I believe my oldest boy has the vocabulary he does is because he is around adults 80 percent of the time. And the fact the talks ALL the time could be part of it too. I swear that kid has been stringing complete sentences together since he started talking. I really should start writing down some of the things he says, but I never do, and when I do want to write them down, I have forgotten. Last night it was getting late, and I hadn’t made any supper yet. My husband and I were trying to figure out what to make with what we had in the house and were to the point of giving up. Shaun was playing with an old cell phone and eventually brought the phone to his dad. What he asked next about melted my heart. He asked his Dad to call his Dad because he wanted to talk to him. For those of you who don’t know about Steve, I’ve written about him a few times and he holds a very special place in our hearts. My husband flashed me a look and played along, pretending that he was talking to his Dad on the phone. It was pretty cute and I about had to leave the room for a good cry. But I smiled and thought how good it was of an almost three-year-old boy to ask about his Grandpa that he really never got to know. This morning Shaun told me to put both of my hands on the steering wheel. I turned and looked at him and asked why? His reply, Because! I asked, “Am I scaring you?” Yes.. Oh boy.. I think I’m in for it! 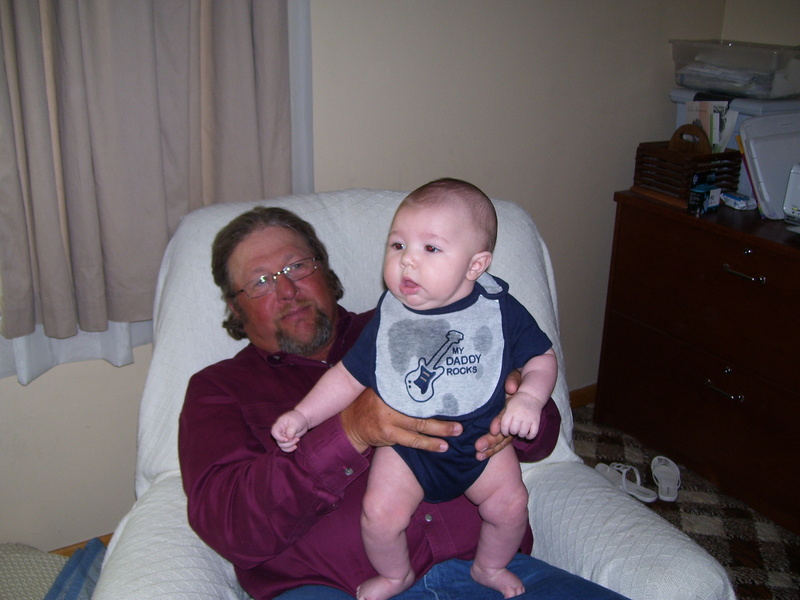 Shaun with his Grandpa Scott in August 2011. Happy anniversary to my blog! Apparently today is the second anniversary for my blog. I have been feeling bad for not being a very good blogger. My last post was in November 2013, and when I went today to make a short post and found a neat little reminder that it’s my anniversary with the blog. How coincidental! I started this blog when I was still working from home and needed an outlet while staying home two days a week with my then 8-month-old son. I blogged quite often, and got a lot of feedback. Seems as though the days are busier now, and may get even busier with the arrival of our second son in early February. I’m hoping with one in daycare and the second one at home with me for 6 to 8 weeks, I can get back to blogging more, but don’t count on it. I’m positive I will need a creative outlet while at home. I’ve come to dread January, mainly because of the weather and cold, but also because of a certain date. Jan. 21. It’s been two years since my father-in-law died on that day. On Jan. 14, 2012 we spent most of the day with my FIL and his mom at a family function and then they came and spent some time at our house with us. On this Jan. 14, I was at work and happened to glance back at some photos of my son and noticed the date. They were taken the day Steve died, but in the morning. If we had only known how our lives would change so much that Saturday, I would have done a lot of things differently. Not much we can change now, but it’s a thought I have often. I sure miss the guy. I do think Steve would be proud of all the work Spence has put in at the farm. He’s made a lot of improvements to the facilities, particularly the pens and working chutes. He’s built the cowherd up and has continued to keep all the leases on the crop land his dad once had. I’m pretty proud of him for doing what he has with what little he has had to work with and doing most of it himself. I’m sure he’d have all the help he could ask for if he’d just ask, but that’s just not him. He puts his head down and gets the job done, no matter how long it takes. There are some nights where he doesn’t make it home until well past dark, but (even though it doesn’t seem like it now) it’s worth it. It’s worth it to keep the farm in the family. I also think Steve would get a kick out of his grandson. For being only two and a half, the little stinker surprises me every day. Whether it’s something he has said or asks about, I’m continually amazed. I think he’s gained his grandpa’s love for that farm, and I hope it continues to be a place where he can have fun and grow up. 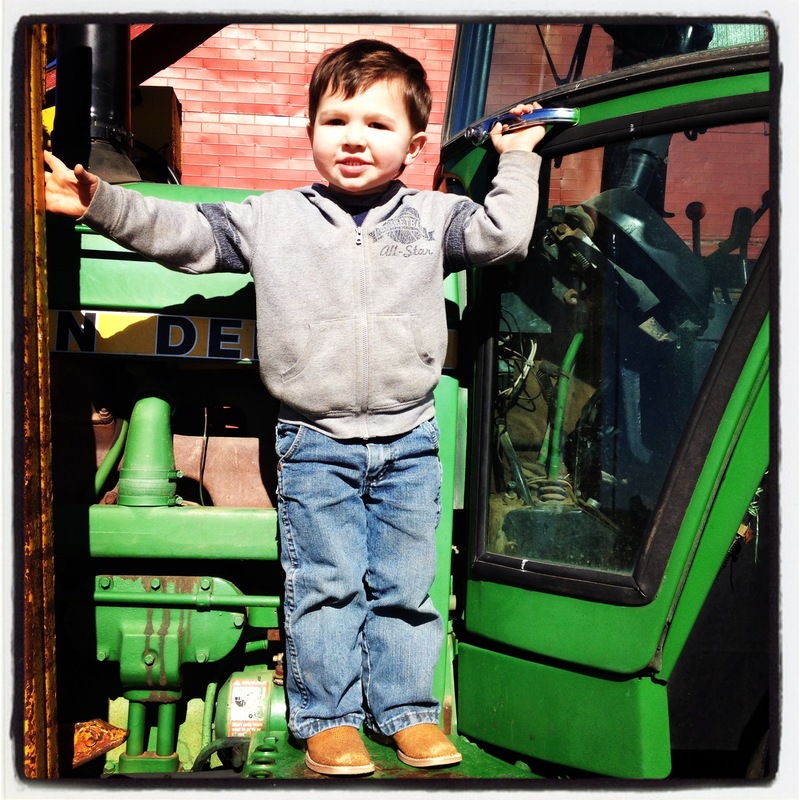 Shaun’s favorite place in the whole world – the Scott family farm on the tractor. Facebook and Twitter blew up last night after the Ram Trucks commercial aired during the Super Bowl. I would have done the same to my own news feeds, but my battery was dead on my iPhone. This morning I watched the 2 minute clip again and again, and again. See it here. Every view/share it gets Ram will donate up to $1 million to FFA. I was at my sister’s house watching the game and socializing. There was about a half-dozen kids around and the house was loud. When the commercial started her and I both stopped and she turned the TV up pretty loud. We hushed kids and watched intently. I was impressed. Paul Harvey’s voice and the impressive photography sucked me in. Now, I may be partial to the whole Dodge trucks and farmer concept. For as long as I can remember, my folks had Dodge and Chrysler products. It’s very hard for me to even consider driving another brand. I own a Dodge truck now and I am very proud of it. My dad farmed for a number of years when I was growing up, worked at the local John Deere dealership and now has his own cattle herd. My grandparents farmed on both sides. My great-grandparents did too. Some of my relatives even homesteaded in the county I live in. My husband is now trying to carry on the small farm dream with our own little family. The third time I watched the video of the commercial I noticed of the 577,000 views it had at the time, 900 people gave it a thumbs down and didn’t like it. I was a little disgruntled by that fact. I guess I need to take off my rose-colored glasses and see how the rest of the world thinks, not just my agriculture-industry peers feel. I don’t have many friends or family for that matter that aren’t involved in agriculture in some way or another. Scrolling down through the comments you see anything from how Monsanto rules the world, or big corporations are killing the small farmers and ranchers to GMOs, to how the government provides farmers welfare and some blatant inaccuracies. I was not impressed. I had to stop reading these idiots’ comments. Where is the respect anymore? Hide behind your computer screen and complain about things. I’m not complaining. My face is out there and I’m not hiding. Others have blasted that the ad wasn’t selling anything or it was hard to tell what was being advertised. For real? Does a commercial always have to shove “buy this” down our throats? Why can’t a million dollar commercial remind us where our roots lie? It’s not about the kind of truck you drive or the kind of combine you use or what you think about Paul Harvey. 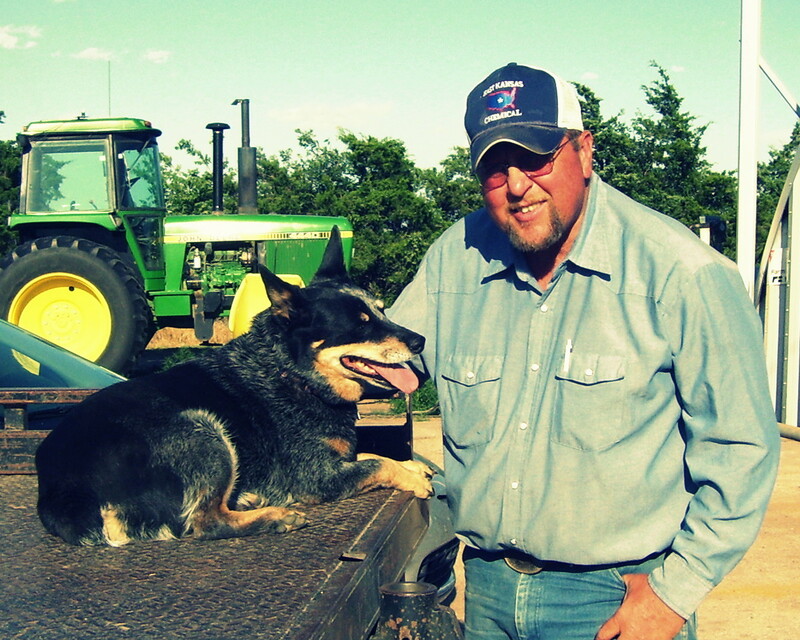 Farming is a way of life and a pretty darn important one. Food, feed, fiber and fuel. I’d like to see how long people can live without farmers, ranchers and agriculture. 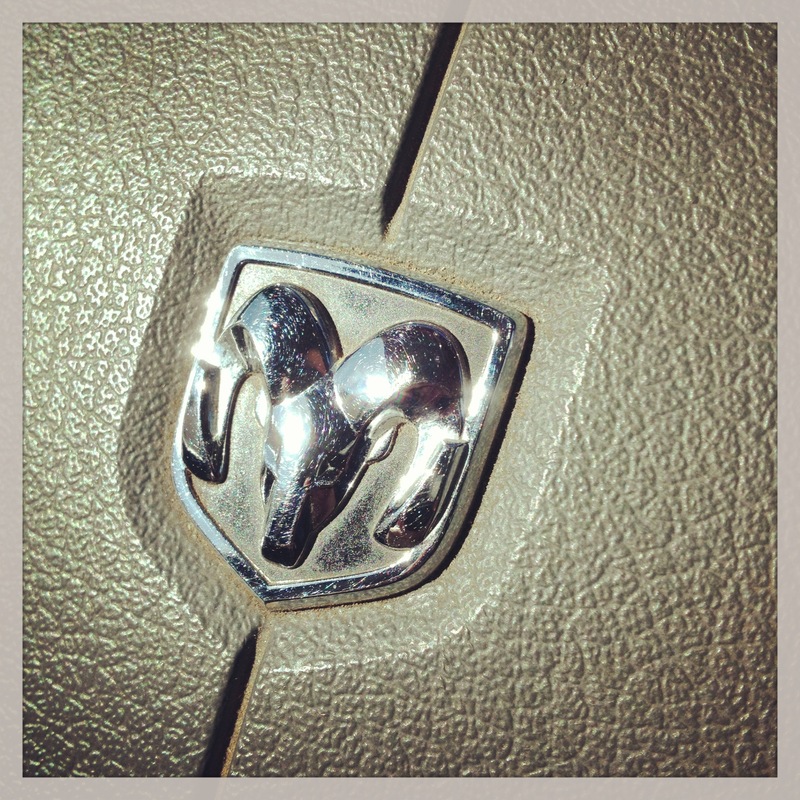 Proud Dodge Ram owner and farmer’s daughter. My brain is pretty weird, and I don’t understand the way it works some times. Remembering is often difficult. I tend to blame it on not listening or being distracted or the fact I gave all my good brain cells to my son. I remember faces just fine, but often have a tough time paring them with names. I can remember the date of my first rodeo win and most details about the day my son was born (parts are still foggy because of the drugs). However if you were to ask me what I wore a week ago or what I had for supper two days ago, I’d have to consciously think about it. But clothes and food memories are pretty irrelevant in the grand scheme of things, aren’t they? There is a particular day coming up that I haven’t decided if I want to even remember yet. On Monday it will be the one-year anniversary of my father-in-law’s death. I sure as heck don’t want to relive the events of that day a year ago, as I think about it often as it is. More often than not I have to remind myself that God has a plan and he needed Steve more than we did. That’s still hard to do. However, I am choosing to remember more often the times we spent fishing or sitting around in his shop solving all the worlds problems over cans of Coors Light. Or how he taught me that red beer is much better with salt and pepper. I’d like to think I was the one who introduced him to red beer, but again my crazy brain won’t let me remember. I won’t forget the time my husband and him decided to start raising chickens. After a trip to Buffalo, Okla., to a “rather strange” guy selling all kinds of baby chicks (that my husband found via Tradio a radio program on a Woodward, Okla., station). My husband, my in-laws and I piled into the car and away we went. Unfortunately the car broke down and the chicken guy let us borrow his pickup (a single cab) to go back home. What a nice guy! The weeks after were spent looking at the chickens planning a business selling eggs. And then came the butchering since the “hens” we were sold turned out to be boys.. Oh man, that was a good time! But I will spare you the gory details. Another time I had gotten a different pickup and didn’t have a gooseneck ball in the new one it yet. Sometime during that particular day while I was at work my horse decided to try to cut her back foot off. She was squirting blood when I found her and needed a trip to the vet. My husband was still working and I was without a vehicle to take her to the vet with. I was bawling and called Steve. Being the softy he was he brought his pickup down and while we waited on Spence, I couldn’t stop crying because of the horse. We stood in the yard and bawled together. The horse survived and Steve bought me a gooseneck ball for my pickup for my birthday. That wasn’t the first time Steve would come to my rescue. During the summer of 2010 my husband went on wheat harvest. My sister and I decided to go to a barrel race one evening after work. It was 100+ degrees and it took longer than normal to catch her horses because they didn’t want to be caught. By the time we got to Ashland we were running late and she was driving faster than she probably should have on a light (ok, very light) tank of fuel. Who knew a 1/4 of a tank wouldn’t go 50 miles. Right outside of Ashland her pickup died and luckily there was a nice farmer who pulled her pickup and trailer to the fairgrounds. Her husband was gone trucking and mine was in South Dakota. I thought who do I know here that could help us? Steve! I called and told him what had happened and he brought some fuel with him. I called my dad too and he brought my pickup just in case we didn’t have a vehicle to get home with. We went ahead and warmed our horses up and ran. By the time the race was over Steve and some others had managed to get us running. Always gracious to me he wouldn’t take any money and I stuffed some cash in his shirt pocket and gave him a huge hug. While I may not remember his reaction the first time I met him, I do remember his reaction when I won my first saddle; when Spence and I announced our engagement; his face at our wedding; and when we announced we were expecting our first child. He was one to show his emotion and not be embarrassed about it. Until we meet again, I will continue to remember all the good times and smile when I think of you. My father-in-law Steve and his dog Dolly. I’m a couple of days late in posting about my Memorial Day adventures, but in my defense I have been preoccupied with a neat dresser makeover so no time to write. I will share the dresser DIY process when I finally get it done. On Monday, my mother, older sister and her husband and I went to visit the cemeteries and place flowers on “our” graves. I like to do this with my mom and siblings because it gives us a time to reflect and remember. Plus its about the only time of the year I go visit the graves. This year since I have the new camera I took it along hoping to capture the scenes of the day, and I did get some neat shots. Although, I did channel my grandmother since we have pictures of relatives graves in our collections. Not my normal subject matter that’s for sure! First we went to the Maple Grove cemetery here in town, stopping to lay some beautiful sprays my mother had made on my grandparents on the Orebaugh side as well as great grandparents (Orebaugh and Drewes (both who I never had the chance to meet)). Also Aunt Lucille and Uncle Ralph’s (who died when he was 4) graves. We then stopped my favorite little country church near Offerle to decorate the Wetzel side of the family. Little cemeteries are my favorite since the dates are always old and the designs are different. Plus it gives me an opportunity to see where I come from. There’s lots of German heritage in that little cemetery. Since it was nice weather I talked mom into taking us by the old dairy farm she was raised on. It’s still in the Wetzel family, but has fallen into disrepair. I got some neat shots of the farm, and will have to find something special to do with them for my mom. It was quite the adventure, but I will share that in another post. Here’s some photos from our Memorial Day journey. When I was a kid, I spent a lot of time at my grandparents’ house. My parents were busy farming, and especially in the busy summer time we needed to be supervised while they were working. Most of my favorite childhood memories involve being at Grandmother and Grandpa Roy’s or at Spearville with Grandma and Grandpa Wetzel. It was a fun time and some of the memories are so engrained in my brain its easy to revert back to that time. When we were staying at Spearville, it was a time that kids could walk all over the little town and get into trouble and still stay safe. We would walk across two streets and a couple of lawns and we were at the swimming pool. We knew what time the pool opened and what kind of candy the loose change Grandma had sent with us would buy. We’d swim all day and walk back home tan and wore out. Grandmother Orebaugh would usually make us work, and one of the most favorite memories I have of spending time with her was when she let my sister and I drive the car along the fenceline while she picked up and/or threw tumbleweeds over the fence. She would save some of the tumbleweeds in the trunk of the car – for what – I don’t exactly remember. We were pretty young, and I’m sure kids of that age wanted to drive the car, even if it was only going 10 mph in the pasture. Of all the good memories I have of my grandparents as a child, my “grown-up mind” sneaks in some of the bad. I remember hearing hushed talk of my Grandmother Orebaugh going to the hospital because she was “sick” and not well for us kids to be around. She was beginning to lose her memory and may even have had the start of Alzheimer’s. (My Grandpa Roy and Grandmother Orebaugh died in a car crash in 1989). As an adult, in recent years I’ve had to cope with my remaining grandparents getting old, living in nursing homes and then passing away. Since I don’t have any more living grandparents, it was easy for me to latch onto my husband’s grandma Pauline. When we lived near to her it was easy to stop by and see her for a bit. She always had a story to tell and wanted to know about what was going on in our lives. 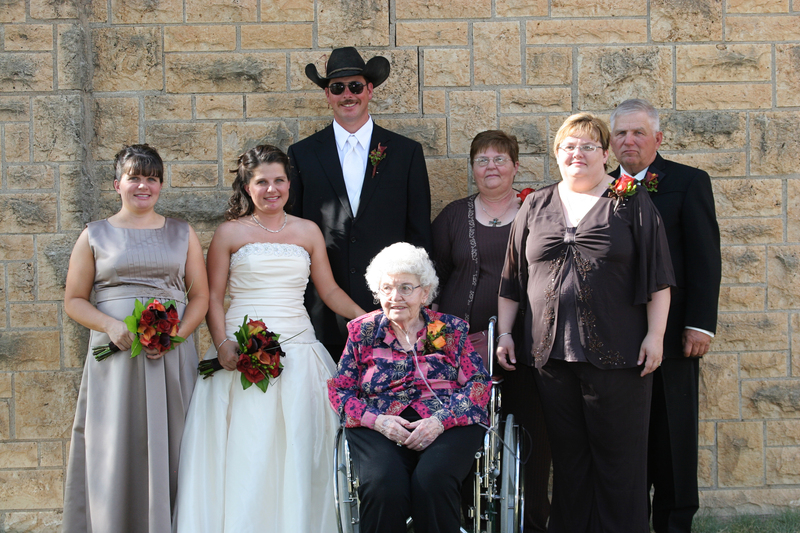 My family with Grandma Wetzel at my wedding in 2009. Grandpa Wetzel died in March of 2009. In recent years, I’ve noticed how hard it was for her to just get around and little things she always took care of were hard for her to do any more. The garden just got a good weed-eating instead of new flowers each spring. The mailbox was moved to the end of the sidewalk so she wouldn’t have to go all the way across the yard to get the mail. Her shopping trips to Dodge City were limited. She’s had a rough year so far, and in the last month she has been hospitalized and not doing well at all. I’ve been hoping and praying that she will get well again. It sure is tough seeing her like she is now. 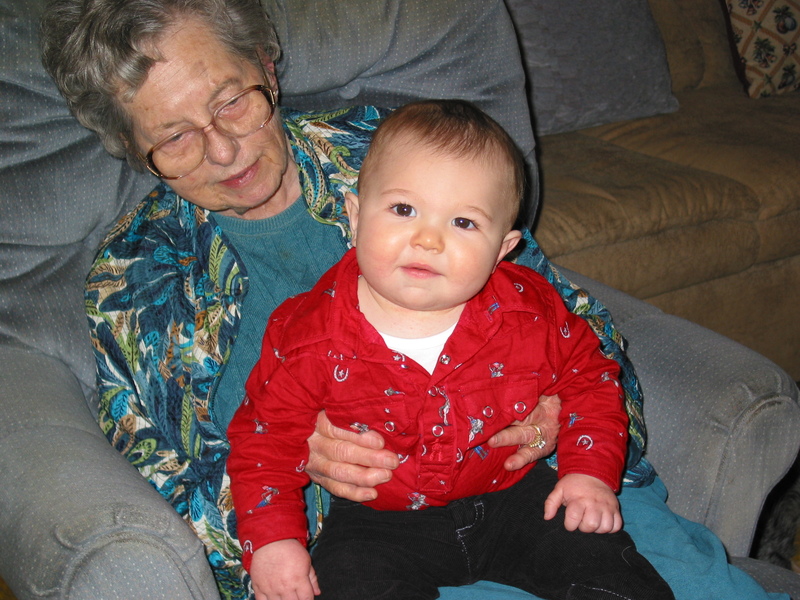 Shaun with his Great-Grandma Pauline Scott. On my way back from a wheat field day yesterday for work, I took a little side trip through the countryside looking for a pretty setting with some wheat fields in it to photograph. I first swung through Offerle and down the street my great-grandparents used to live on. I thought their house was at the end of the street, but my mind was mistaken. I found the house, and while it still looks a little bit the same, it wasn’t. The porch was closed in and the beautiful gardens and flowerbeds were gone. The huge side yard was gone. Made me sad to see. Least it was still there and I have all of my wonderful childhood memories spending time there with my cousins and family. I wondered what the inside looked like, but drove on, saddened by the change. South of Offerle I saw a lot of green wheat fields, and just kept driving the back roads. I took a few pics here and there, but the main thing I noticed was all the old farmsteads. Some of the houses were gone and the outbuildings remained. Others were missing the barns and other buildings but an old, falling down house still stood. Occasionally I would run up on a new place, all mowed and proper with a new(er) house and new barns and farm buildings. I like old houses. They have character and craftsmanship. The builders cared about what they were doing and made the homes to last. I live in a new home, a modular we set in 2010. It was a model home, so it had some wear in it to begin with, but it doesn’t have the character of a home built 50 years ago. If I was rich, I’d buy one of the old broken down farm houses I seen on my drive yesterday and fix it up. It would be a total money pit, but it would be fun. At least to me anyway. Here’s a few photos from yesterdays drive.